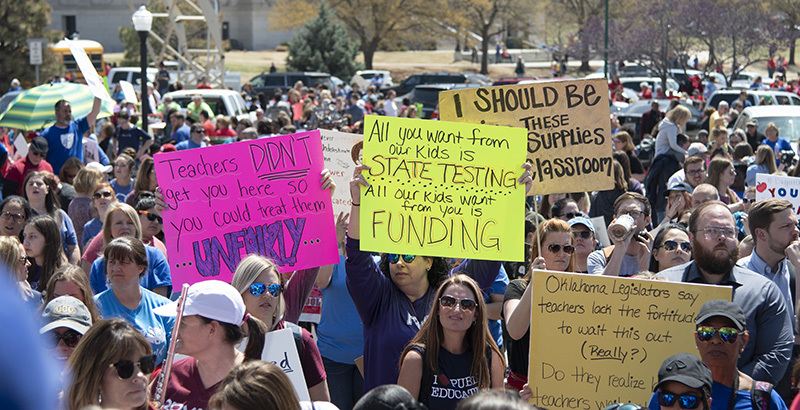 As teachers in Oklahoma returned to class, hundreds of educators in Colorado rallied at their capitol today to demand higher pay and more education spending. Arizona teachers will vote this week on whether to stage a walkout, and Kentucky schools are back in session after a tense weekend. In Colorado, the latest front in teacher unrest, at least one district was closed Monday because of the number of teachers who called out of work to attend a rally at the capitol. Colorado Education Association President Kerrie Dallman told CBS 7 in Denver that educators are concerned about teacher shortages, underfunding of schools, and teacher pensions and pay, which is among the lowest in the country. In recent years, Colorado has created several programs that help teachers pay for housing, and about half of its districts are running on four-day school weeks because of tight budgets. Dallman said the union will take cues from its 35,000 members in deciding whether to organize future protests. After a contentious end to walkouts in Oklahoma, with some teachers continuing to protest at the capitol Friday after the union called on them to return to class, school resumes this week. The educators and their union have turned their attention to Election Day. Several teachers have filed to run for office, and countless others have vowed to make education a key issue in the run-up to November’s elections. Several Oklahoma districts will lengthen the school day to make up for lost time during the two-week walkout. In Arizona, teachers in a grassroots group called Arizona Educators United will vote this week about whether to stage a walkout, AZCentral reports. They will have a second statewide “walk-in” Wednesday as a show of solidarity that doesn’t disrupt classes — and that will hopefully serve as a gauge of community support for a potential walkout in the future. Their demands include a 20 percent raise for teachers, competitive pay for support staff, increased education spending, and a freeze on tax cuts until per-student spending reaches the national average. Arizona Gov. Doug Ducey, a Republican, has said he will find a way to increase teacher pay by 20 percent over two years and increase education spending, but he has not explained where the money will come from, according to Vox. Kentucky Governor Matt Bevin shook up the conversation in his state on Friday when he blamed teachers for children being exposed to sexual abuse, drugs, and poison while home from school unattended during Friday’s walkout. Bevin later apologized, but not before a majority of state representatives — both Republicans and Democrats — formally condemned the comments. More than 30 districts closed schools Friday because of the number of teachers requesting time off to protest at the capitol. The Republican-controlled legislature in Kentucky also overrode Bevin’s veto of the budget and a tax reform bill, which includes an increase in education spending through a $480 million tax increase. Teachers and students returned to school Monday. In Indiana, where there has been chatter about a potential strike, teachers will likely wait to decide on taking action until the assembly is in session, the Indy Star reports. Educators are concerned about stagnant teacher pay and per-pupil funding, so they will be watching lawmakers as they prepare for next year’s budget session, the state union president told the Star. Teacher walkouts in West Virginia inspired much of the action after educators there won a 5 percent raise following a nine-day walkout earlier this year. However, journalists and other observers argue that the view of the strikes as a “red-state revolt” is incomplete, noting that the action started as a nonpartisan movement and not all teachers are Democrats. In Kentucky, for example, most are registered Republicans.